8-Track Tapes Belong In A Museum : The Record The much-maligned 8-track tape is a thing of beauty for a new museum devoted to the format. Old-school: Excerpts from Wagner's The Ring cycle on 8-track. Today — when you can literally take your music anywhere — it's hard to imagine a time when that wasn't possible. So, if you're old enough, cast your mind back 40 years or so. Remember 8-track tapes? In the 1960s and early '70s, they were the way that millions of Americans took their music with them. Now, a museum devoted to the obsolete format is open in Dallas, Texas. Bucks Burnett is its proprietor. He caught the 8-track bug when he was rummaging through bins at a garage sale in 1988 and something caught his eye: the Beatles' White Album on 8-track tape. "And so I'm thinkin' 'I'll get this for 50 cents.' And I said, 'How much for the 8-track?' And the guys says, '$7.' And I said, 'No, the 8-track? How much for the 8-track?' And he said, '$7.' I said, 'Will you take five?' He said, 'Put it back in the box.' I said, 'OK, wait a minute. Why is this 8-track $7?' And he said, 'It's the Beatles. It's the White Album. Where you gonna find another one?' And I gave him $7." More than 3,000 8-tracks later, Burnett's collection is so large he opened the 700 square foot Eight Track Museum (take a video tour). He displays between 500 and 1,000 tapes, as well as an example of every type of physical recorded music from the wax cylinders of the 1800s to the iPod. Wearing a Pink Floyd T-shirt, Burnett brushes his long, stringy grey hair out of his face and sits down on the museum's teal floor to thumb through the clear plastic boxes that hold his tapes. "I have a lot of Pink Floyd 8-tracks," he says. "Everybody remembers Dark Side of the Moon, but how many people have it on a quadraphonic purple 8-track? That's pretty cool." The 8-track started to get attention in 1965. That's almost exactly when cassette tapes where introduced to the market. The difference is that 8-tracks were marketed to play music. Cassettes were pitched as at-home recording devices. When Ford Motor Company began to offer 8-track decks in its 1966 model cars, the format took off. "It gave people mobility for their music collections," says Howard Kramer, the Curatorial Director for the Rock and Roll Hall of Fame in Cleveland. "It allowed you to say, 'I'm going to go on a trip. I'm going to stop at the store and I'm going to buy the new Beatles record, the new George Jones record, and, oh, there's a compilation of stuff on this particular label.' And be able to listen to just what you want and not twist around on the AM dial trying to find music." But 8-tracks did have their limitations. Say it's 1977 and you're listening to the newest David Bowie song through your girlfriend's portable 8-track player. 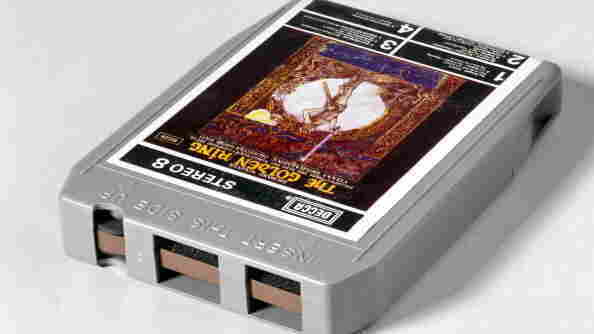 8-track tapes typically divided up a two-sided LP into four programs. If the songs could not be split up evenly, a song might be cut in two. First it would fade out; then you'd hear a click that indicated the program change. Burnett says the dreaded click could be a mood killer, depending on, well, the situation. "Typically, you would — just for two or three seconds — you would stop making out. Wait 'til the click and then go back at it. It was sort of a ritual," Burnett remembers — not so fondly. By the late '70s, format wars were being fought on multiple fronts. VHS tapes were taking over the home-video market from Betamax. And the public began to buy more cassettes than 8-tracks. The Rock Hall's Kramer says there were plenty of reasons. "The cassette surpassed the 8-track because of its mobility and also its fidelity," he says. "There was less cramming of music onto the tape, and they were smaller and easier to carry." That mobility was increased as boomboxes and other portable cassette players like the Sony Walkman were introduced. But despite its drawbacks, Burnett says the 8-track's legacy is worth preserving. "We all have formats we like. We all have formats we hate," he says. "But the thing is, every single format was someone's format. That format is what connected them with music." The 8-track wasn't even Burnett's format. That was the cassette. And he says he doesn't actually listen to the 8-tracks he has. "Let me explain something — a lot of people don't understand this. I am a collector," says Burnett. "I buy things. I don't use things. I buy things. That's what collectors do. I'm not saying it's healthy." Since picking up that White Album at the garage sale, he's become a fanatic. The museum's $10 admission fee will allow him to grow the collection. Burnett is taking this 8-track thing one step further: he's launched an 8-track label called Cloud 8. Burnett describes the venture as a "dead format" label. He's already signed a Dallas band called The O's, as well as '80s new wave act Tom Tom Club. Cloud 8 will release 30 copies of Tom Tom Club's 2010 album, Genius of Love, as a limited-edition 8-track to celebrate the band's 30th anniversary. Tom Tom Club founders Tina Weymouth and Chris Frantz say they actually feel the format could be making a comeback. "We feel inspired and astonished that in our 30th year, Tom Tom Club's Genius of Love will be available through a technology platform that is clearly on the rebound from obscurity to its rightful place as the transcendent format of the 21st century," the couple said in a joint statement. Burnett's larger goal is to preserve all of the physical pieces of music history that have become obsolete in the age of digital music. "We're moving on to nearly 120 years of prerecorded, physical formats that were sold to the public. That's absolutely astounding to me," Burnett says. "Are we really going to let all of that go away and disappear just because of a little thing called an mp3? Not on my watch we're not."